What comes up is eating, drinking and sitting down to listen to music. Nothing wrong with eating, drinking or music, we LOVE all of these. And, we want to see our Houstonian friends outside digging all this city has to offer. With 52,912 acres of parkland, 163 miles of biking trails and 2500 miles of waterway there is no shortage of playgrounds. BCO & HTXO are on a mission to teach our friends everything they need to know to be an outdoor ninja. 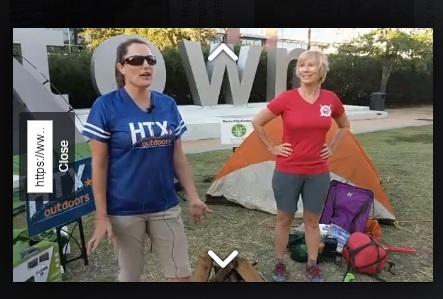 We are bringing Houston Outdoor LIVE to a local locale near you (while broadcasting LIVE on Facebook for those who can’t make the show). 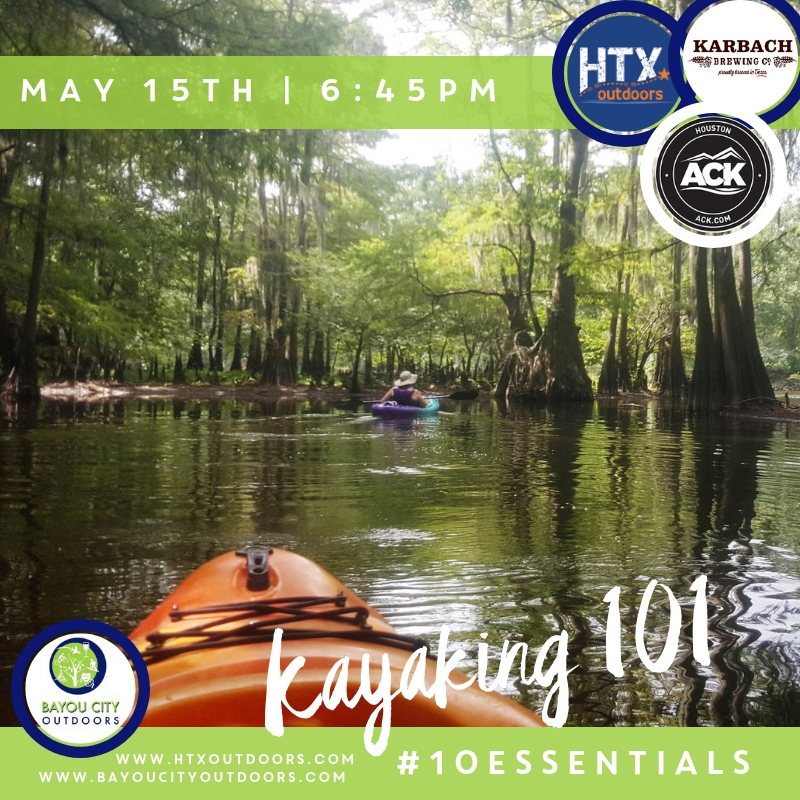 From parks to bayous, bike trails to hiking trails we’re highlighting the Great Outdoors in Houston by uncovering everything there is to do, plus showing how to do it! Ready to put your newfound know-how to the test? Join BCO and we'll loan you the gear, set up the event and send a knowledgeable Event Leader along to help. Couldn't be easier! This week we talked all things cycling. We went over what you need to know to transport your bike, change a tire (and air your tires up), fix a chain, do a safety check and time permitting shifting and clipping in. There was a Q&A at the of the presentation to help guide everyone into outdoor fun mastery. Everything you need to know to keep your pack light and hit the trail with confidence! Houston may not be known as a camping mecca, but travel an hour any direction, and you can find yourself sleeping under the stars. Join us for Camping LIVE this month, where you’ll learn everything you need to know about camping to make you feel like a pro (or at least an Eagle Scout)! Ever heard of car camping, primitive camping or backpacking, and wondered WTH? We’ve got you covered, and you’ll be picking your site with confidence in no time at all. 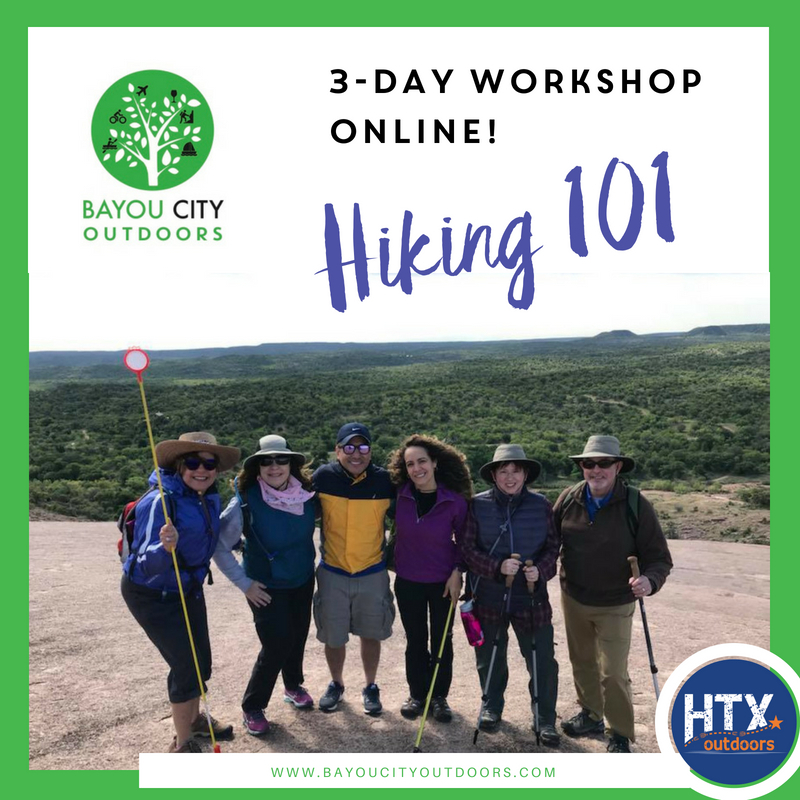 We’ll also review equipment you will need and don’t need, demonstrate different tents, show you how to set it all up, and share our favorite camping gear. Kayaking, it's friends, it's meditation, it's an adventure, it is whatever you want it to be. With miles of bayous, unlimited lakes and seashores, we live in a kayaking haven. Everything you need to know to keep your pack light and hit the trail. One of the big mistakes is over packing. Some of us might have a special set of skills for fitting an outstanding amount of objects into our purses, and a backpack is no different. However, like life, backpacking is all about balance and the trick is to keep your pack light enough to carry while still having everything you need. This week we’re talking all things cycling. We will go over what you need to know to transport your bike, change a tire (and air your tires up), fix a chain, do a safety check and time permitting shifting and clipping in. We’ll take Q&A at the end of the presentation to help guide everyone into outdoor fun mastery. One thing we all know about Houston and the great outdoors, you can count on the weather always changing. Tonight, we’ll talk about being prepared for all temps. Plus, we’ll go over the top 10 Essentials for your pack and how to pull them together inexpensively, and still keep your pack light. We’ll also go over some of the better trails around Houston and Texas. We’ll focus on keeping it a little more local and throw in some tips for staying in hiking (and backpacking) shape in the winter months. Camping will never be the same once you add Dutch Oven Cooking to your mix. Forget about hot dogs on a stick and beans in a can and start thinking Pot Roast, Pi, za and Enchiladas! Instead of oatmeal or cold PB&J, you can fry up some bacon, potatoes & eggs… or even bake some biscuits and gravy. And for dessert… Dutch Oven Brownies are the best and our signature tasty on a camping trip. Let's face it - if you pack incorrectly you are either going to be bummed, miserable or buying a bunch of stuff when you should be playing! Whatever your journey, one thing we know is that you’re going to carry everything with ease! Forget something at home and you might find yourself missing out on all your trip has to offer or worse- you could find yourself up a creek without a paddle, literally! Just travel an hour in any direction away from the skyline and you can find yourself sleeping under the stars! There are so many ways to camp these days: hammocks, tents, in or on top of your car, there’s even glamping. Plus, there’s primitive camping, car camping and backpacking; are you lost yet? We’ve got you covered, and you’ll be picking your site with confidence in no time. We’ll review equipment you need and don’t need, demonstrate different tents, set up and chat about our favorite camping gear. With miles of bayous, lakes and the almost flat summer surf of Galveston, we have an unlimited playground to try SUPing. Anyone can do this sport. It is low impact, uses practically every muscle in your body, is great for cross-training and is a ton of fun! While you work on your balance, you’ll work on your core. Plus, you can saunter along the bayous or paddle fast and turn it into a BIG aerobic workout. Houston is where it’s at when you're ready to spin the pedals. Cruise, commute, mountain bike or road bike, we'll show you where to go and how to get started. Who needs to drive when they can ride? From the ABC’s of bike maintenance to choosing a bike or where to ride, we’ll have you riding the streets (or the trails) on your bicycle with ease and confidence.